Well I knew Australia was big, but seriously. WA really does take the biscuit. You can drive all day out here and barely make an indentation on the map - just your wallet, with the price of gas nudging $2 a litre. 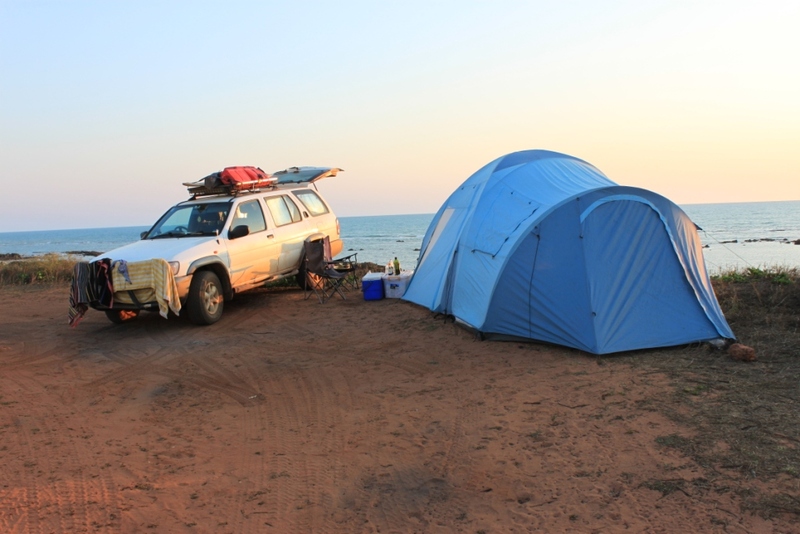 I'm writing this from a little spot just out of Exmouth, which is a sea port around 1200km or so north west of Perth on Australia's west coast. We're camped in a lovely little strand of pine trees right on the beach, just next to a large 'No Camping' sign, which we're hoping doesn't apply to us. Since my last post we've logged another 1000km or so behind the wheel, and really all we've done is nip down to Karajini National Park and back out to the coast again. Karajini is awesome. 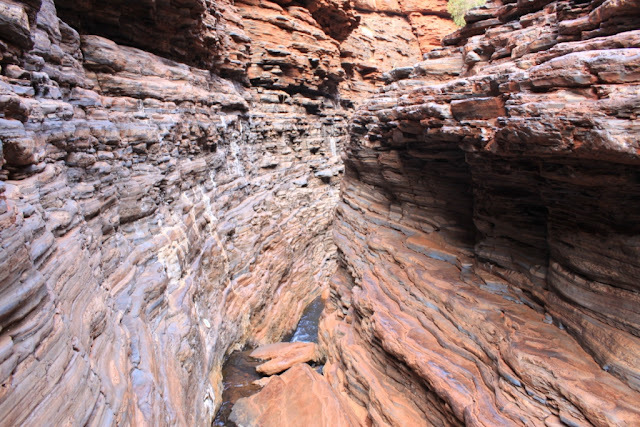 If you like canyoning, you've got to go to Karajini. Huge chasms split the hillsides, with deep ravines and crystal-clear swimming pools. It's hot, but then the pools are really cold, so it sort of balances itself out. Karajini is one of those places you don't want to be in a flash flood. We read several stories of heroic rescues of tourists who went beyond the signs that say 'Don't go any further' (we do listen to those sort of signs) and either fell or got stuck. In one tragic case a few years back, a bunch of rescuers who were waiting for a chopper in one of the canyons after picking up a stupid tourist who broke his leg got swept away by a flash flood and one of them drowned. His memorial is in the park. 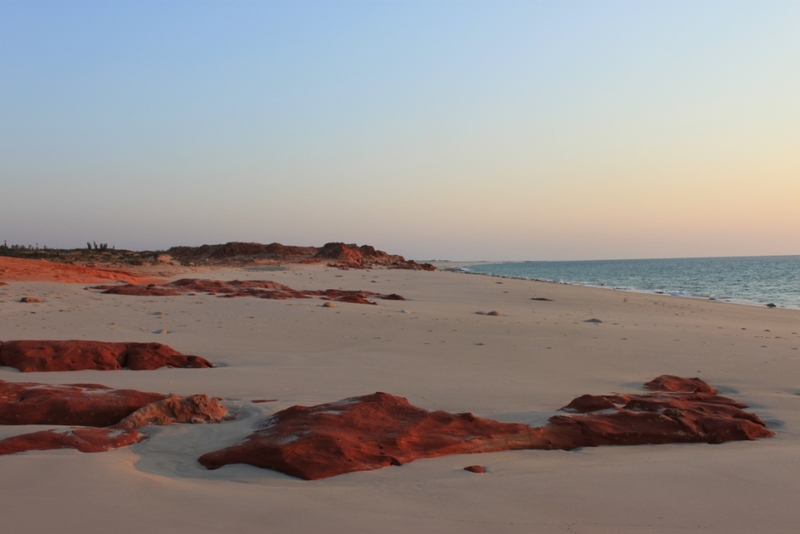 We also loved Cape Leveque, just above Broome. Amazing red cliffs, white sand, and blue blue ocean. Koolaman Resort, right at the end of the road, is to die for, if you've got the cash to splash on a room. We didn't - we camped instead - but it was still amazing, with a beautiful white sand swimming beach. 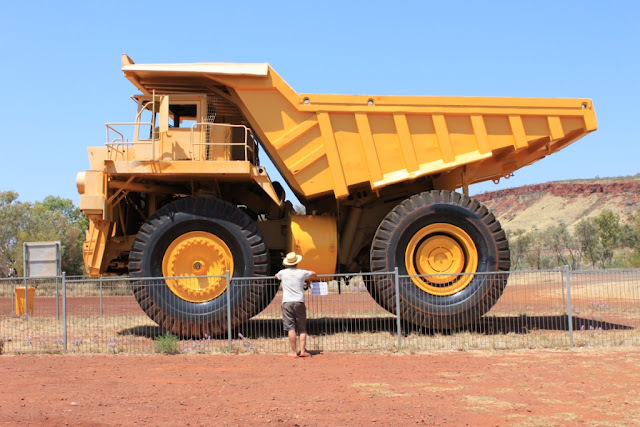 After Karajini we headed through Tom Price - yes, there really is a town called that - and had our photo taken next to one of those mammoth yellow mining trucks. Rio Tinto pretty much owns all the land around there, including its own railway, Pilbra Iron. We got a permit to drive down Rio Tinto's railway access road, which is a short-cut back out to the west coast. All we had to do was sit through a very painful 20 minute DVD, which explained how dirt roads can be very dangerous, how taking drugs and drinking alcohol is not a good idea when you're driving (who knew?) and that one shouldn't look at the big trains while driving for fear of getting distracted! We followed most of the advice but couldn't resist waving to the drivers of the mammoth iron ore trains, each some 2km or more in length. We even got a blast from the engine's horn for our efforts! We wanted to visit Millstream Chichester National Park on our way back to the coast, but a massive Outback fire had closed the road, so we ended up having to do a detour north to the mining town of Karatha, just to add another couple of hundred k's to the odometer. We're really looking forward to Cape Range National Park, which is just beyond Exmouth, which promises coral reefs and some good snorkeling. The westernmost point on the Australian mainland is just south of there, so we'll have to bag that on our way down to Perth.